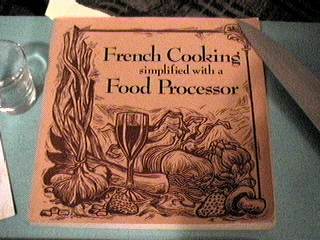 Review of French Cooking Simplified With a Food Processor, with a recipe for Carrot Soup. This is less a list of recipes “simplified” by use of a food processor, then recipes that require the use of one (although for many, a grinder or blender will also do). It also includes recipes that require chopped and sliced vegetables. Obviously, here the slicer and chopper blades in your food processor will simplify things. Of course, a v-slicer will also do for slicing, possibly much cheaper, and a good knife—necessary in any case for pre-sizing chunks for the processor—will also make chopping easier if you don’t have a food processor. The “Hors d’Oeuvres” chapter begins with Stuffed Mushrooms and Snails in Garlic Butter. The processor simplifies the mushrooms by finely chopping the shroom stems and shallots, and mincing the parsley. For the Snails (“Escargots”), it minces the garlic, shallots, and parsley. Both of these recipes are a bit fiddly, food processor or not: you end up stuffing each mushroom or snail. The Snails are definitely worthwhile if you can find a good source for them. But if you put that much garlic and butter on anything, it’ll taste great! There is a small soup section—most of the soups are actually under the appropriate ‘meat’ or ‘vegetable’ section. Potato soup, lettuce soup, carrot soup (see below), spinach soup, bean soup, and salmon bisque are among the high points of this chapter. The seafood chapter starts out strong with “Sea Scallops in White Wine Sauce”, a buttery, creamy sauce for scallops or shrimp. Many of these recipes (and in the other chapters) use pastries or crusts of some kind to encase the dish. The poultry and meat chapters contain good recipes. If I have any complaint about them, they aren’t really that ‘different’. They’re just standard recipes that tell you to use the food processor to slice and dice. Well, that’s nice, but I could figure that out myself. There are some good purees in the vegetable section: grean bean, lima bean, broccoli (now there’s a way to disguise broccoli: puree it). Plus some recipes for normal vegetable dishes. Perhaps the best section, as far as the purpose of the book is concerned, is the “breads and desserts” section. Here, you are making bread in a different way: you’re using the food processor to knead the dough as well as mix the dough. Mixing and kneading cakes and breads and pie crusts is not the same in a food processor than by hand. It really is much easier, and there are some useful, seemingly minor differences in techniques that can make a big difference. Finally, as in any French cookbook, there is an entire section on sauces and the basics of stockmaking. To be honest, I picked this book up on the strength of another book from the same publisher (101 Productions), “A Russian Jew Cooks in Peru”. Also, I liked the woodcut-style illustrations on the cover and inside, by Rik Olson. It’s an okay book, but not great. It definitely doesn’t live up to the promise of its colleague, nor its illustrations. Slice carrots and onion in processor. Melt 4 tblsp butter in saucepan. Add remaining ingredients (except butter). Process soup in two batches till smooth. Return to saucepan, heat, and add remaining 2 tblsp of butter. If you enjoy 101 Productions, you might also be interested in A Russian Jew Cooks in Peru. If you enjoy cookbooks, you might also be interested in A Concise Encyclopedia of Gastronomy, Bull Cook Historical Recipes, Cavalier Cooking, Classic Chinese Cuisine, Cooking the Bahamian Way, Country Commune Cooking, Life, Loves, and Meat Loaf, The Art of Korean Cooking, The Casserole Cookbook, The Complete Book of Oriental Cooking, The Complete Bread Cookbook, The Frugal Gourmet Celebrates Christmas, The Healthy Cuisine of India, The New Larousse Gastronomique, Saucepans and the Single Girl, The Northwest Cartoon Cookery, Good Food From Mexico, Laurel’s Kitchen, The Cooking of Vienna’s Empire, James Beard’s Fireside Cook Book, French Bistro Cooking, A Fifteenth Century Cookry Boke, Crockery Cookery, Southern Cooking, The Frugal Gourmet Keeps the Feast, The Fannie Farmer Cookbook, In Good Taste, Heritage of America Cookbook, Our Favorite Hometown Recipes Vol. II, The Indian Spice Kitchen, Japanese Country Cookbook, La Cuisine Française, Larousse Treasury of Country Cooking, The Natural Foods Cookbook, A Russian Jew Cooks in Peru, Soul Food Cook Book, The Tassajara Trilogy, Pains Spéciaux & Viennoiseries, Whole Earth Cookbook, The Wok: a chinese cook book, Southern Living Cookbook for Two, Lebanese Cuisine, The Art of Syrian Cookery, Popular Greek Recipes, In a Persian Kitchen, The Art of Pennsylvania Dutch Cooking, and The Southern Living Cookbook Library. If you enjoy French, you might also be interested in City of Lost Children, Fahrenheit 451, King of Hearts, An Old French expletive and The Three Musketeers, French Bistro Cooking, La Cuisine Française, and Pains Spéciaux & Viennoiseries. French soups and foods that you can make with a food processor. Which would be just about anything, since it’s main purpose is chopping vegetables. French Cooking Simplified With a Food Processor last modified March 11th, 2013.